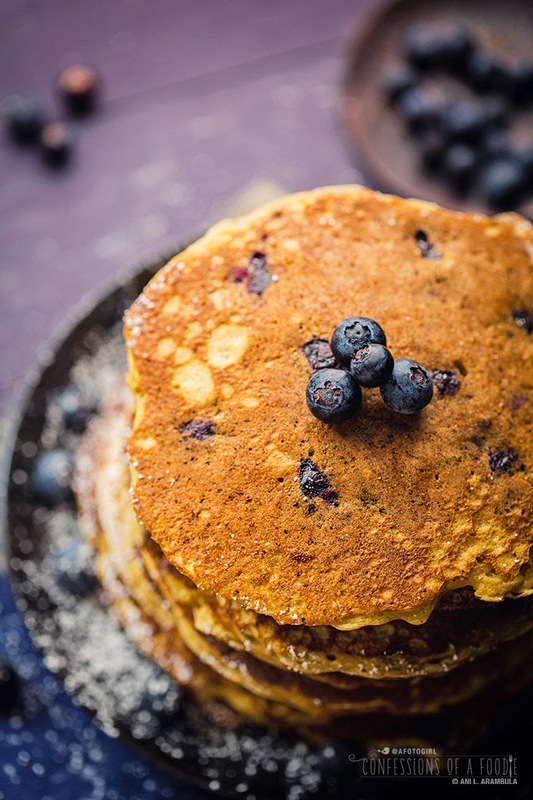 These whole grain pancakes get a boost of antioxidants and phytonutrients from blueberries and a hint of sweetness from a mashed banana. One of the highlights of spending the night at Grandma and Grandpa's when my sisters and I were children were Grandma's from scratch pancakes for breakfast. They were the size of dinner plates, literally, and they were thick and chewy and had a yeasty, doughy flavor that I still long for. We'd slather them with margarine and pour on an excess of light corn syrup and be bouncing off the walls the rest of the day. It was heaven. At home, it was a huge treat for us kids when Mom and Dad would make pancakes for dinner. We always had Bisquick pancakes and absolutely loved them. We thought it was such a decadent treat, pancakes for dinner, and we always looked forward to it. Even more special were those times when Dad was working second shift and he'd come home at 2 or 3 in the morning, wake us girls up with the promise of pancakes. We'd get up, sleepy-eyed and join him in the kitchen for breakfast. Dad's pancakes were fast and easy and extra flavorful because he'd add almond extract to his Bisquick pancake batter making them smell as great as they tasted. He used to regale us with his flipping technique: after loosening the pancake with a spatula, he'd make a quick flick of the wrist and the pancake went flying up in the air before floating back down to settle onto the nonstick pan. They were rich and buttery with that syrup in the bottle in the shape of a lady dripping off of every forkful. When we finished our pancakes, we'd crawl back into bed, carb coma lulling us back to sleep before we'd have to get up to ready ourselves for school. 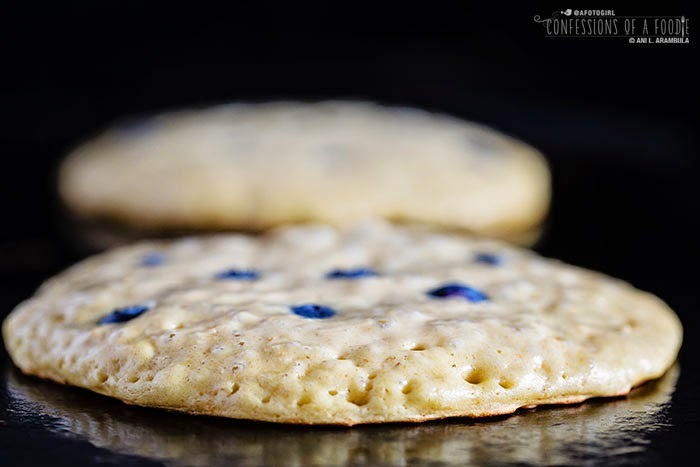 Today is National Blueberry Pancake Day and with the help of Driscoll's, I'm sharing a more nutritious version of pancakes than those of my childhood but nonetheless satisfying. I played around with this recipe quite a bit until I was happy with the balance between flavor, texture, and look of the pancakes. I'm using white whole wheat here. To clarify, white whole wheat is not whole wheat that has been bleached. When I first came across it at the store when I was looking for a white flour alternative, I thought what's the point of staying away from highly refined white flour only to substitute it with whole wheat that's been refined by being bleached? I came home that afternoon and looked it up and to my surprise, discovered that the "white" in the title had nothing to do with bleaching. White whole wheat is made from wheat berries that are white whereas regular whole wheat is made from red wheat berries. Interesting, no? I thought so. And I was relieved because from what I read, white whole wheat still has all the nutritional value of whole wheat but treats made with it are lighter and less dense so I happily brought some home to play with. Also, to boost the fiber and texture even more, I've added oats. Preferably use rolled oats (also packaged as "old-fashioned" rolled oats) because you'll get more texture though quick cooking oats will be fine. If you do use quick cooking, just skip the soaking and add them directly to the wet ingredients. However, I don't recommend using instant oats. These oats often break apart in the packaging, creating a powdery, thick dust and imparting no texture whatsoever. I also decided the recipe was a great one to experiment with almond milk for the first time and I've concluded that I rather like it, much more than I thought I would. Will I give up cow's milk completely for it? Highly unlikely. But I can say that I will definitely be reaching for it more now. To keep the whole wheat tender and moist, I've added some greek yogurt. Since I'm not using buttermilk, it adds just the right amount of tang. Of course, we also get a bit of sweet and tart from the star of this whole ensemble: Driscoll’s Organic Blueberries. These little guys softened by the heat, burst in your mouth when you bite into them, negating the need for syrup. To sweeten the batter itself, I’ve added a mashed overripe banana and just a touch of dark brown sugar. Since I don’t use syrup these days, I like the pancakes themselves to have a hint of sweetness. They taste great as is with a touch of good quality European style butter. And, if you want an additional boost of protein, add a dollop of vanilla flavored Greek yogurt topped with a couple of whole blueberries and a very light drizzle of organic raw honey. So good. I now have a freezer full of "OK" to "getting there" to "wow, these are good blueberry pancakes" that I can take to work for breakfast on the go. Grandma also likes these guys. She piles several on her plate, slathers them with her margarine and her light corn syrup and proclaims them delicious. High praise in my book. Until next time guys, Happy National Blueberry Pancake Day! I prefer to use cooking spray to lubricate the griddle in place of butter. Because you want a nice hot griddle, the butter burns too quickly and over darkens the pancakes before they have a chance to cook fully. I made these both with adding the blueberries to the batter in the bowl and then adding them to each individual pancake just after they hit the griddle. I prefer the latter. 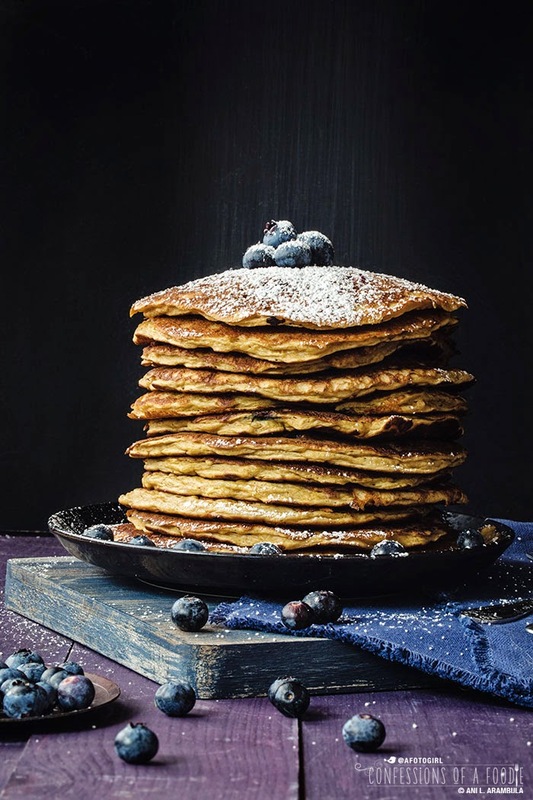 Too often when adding to the batter, by the time you get to the last two or three pancakes, you’re lucky if you get one or two blueberries per pancake. 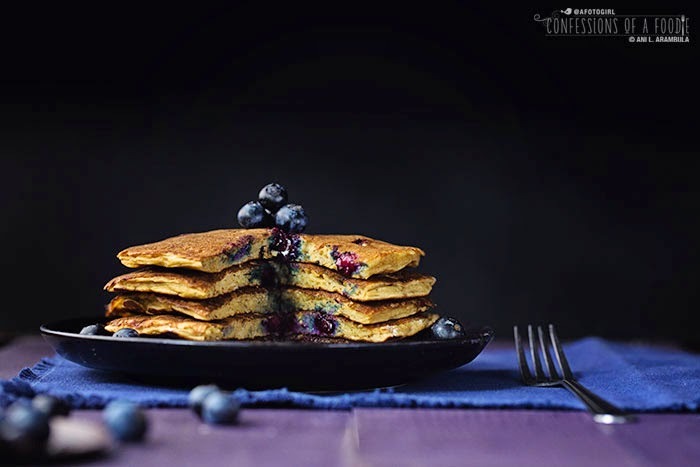 By adding them to the pancake as it starts to cook, you can more evenly distribute blueberries, ensuring nearly every bite has a little purple jewel. Also, I like to use a ⅓ cup sized food scoop as I have more control placing the batter on the grill. Feel free to use a measuring cup. This also ensures a consistently sized pancake. One final and important note: After combining the wet and dry ingredients well, let the batter rest for 30 minutes. Don’t skip this step. It really makes a difference between flat, tough pancakes and lighter, tender pancakes. Why? Ever notice when you make pancakes that the first several aren’t as fluffy and perfect as they are once your mid-way through? I attribute this to two things: first, the gluten has a chance to relax and second, the leavening has had a chance to do it’s magic. Plus, waiting ensures that the whole wheat is fully hydrated before cooking which I feel produces a more tender pancake. 1. Place a griddle or large skillet on medium high heat. 2. 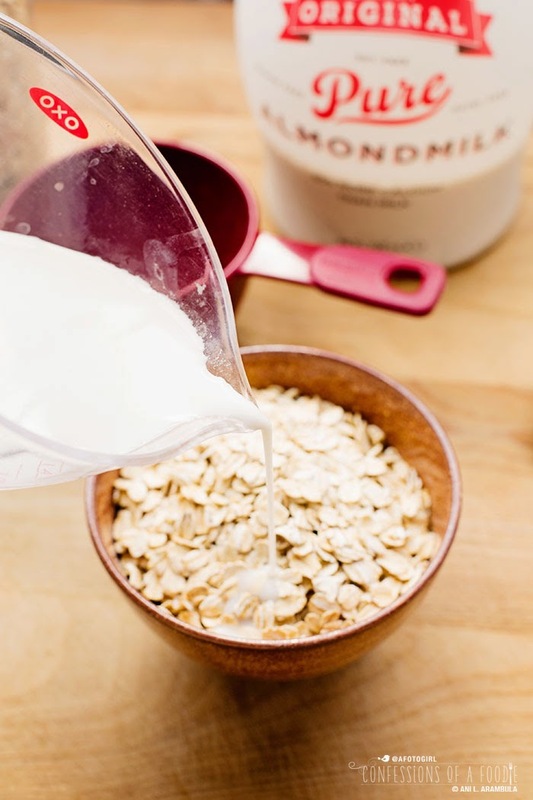 Add the oats to a small bowl and cover with ½ cup of almond milk; set aside. 3. 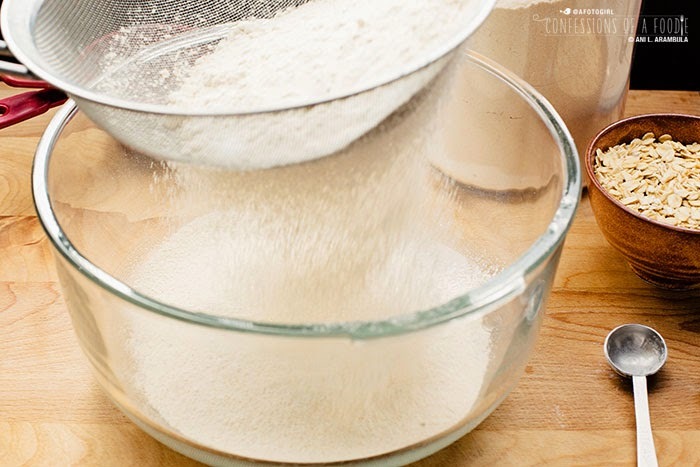 Sift together the flour, baking powder, baking soda and salt in a medium sized bowl; set aside. 4. 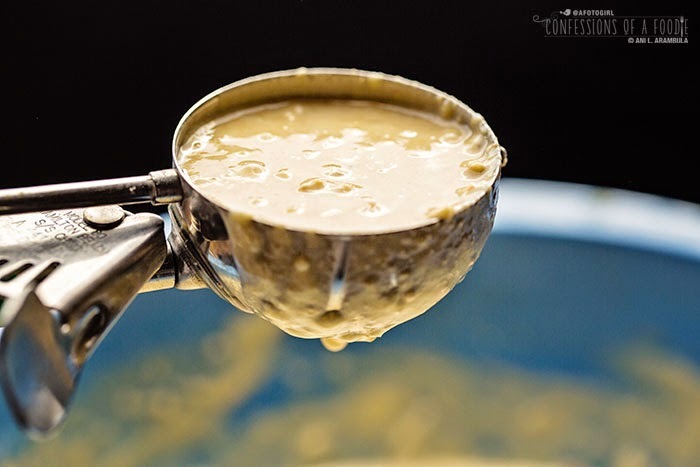 Whisk together the mashed banana and eggs in a large bowl until smooth. Pour in the eggs, whisk. Add the brown sugar, vanilla and yogurt, whisking well until batter is light, smooth and frothy. 5. Add the dry ingredients to the wet a third at a time, whisking to combine after each addition. Now here’s the important part: Let the batter rest for 30 minutes. 6. When ready to cook, spray the griddle with cooking spray. Drop ⅓ cup of batter on the hot griddle. Immediately top with blueberries. 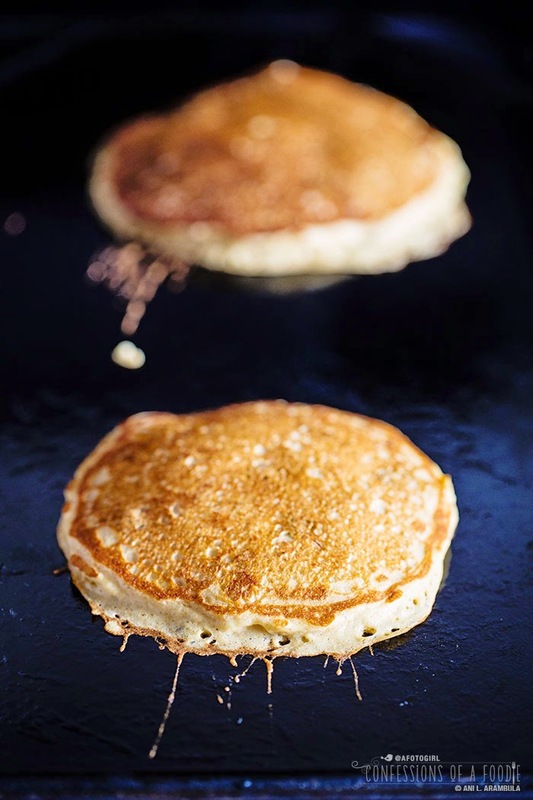 When bubbles have reached the surface and begin to pop and the underside is golden, about 3 minutes, flip the pancake and cook until the second side is golden, 3-4 minutes longer. 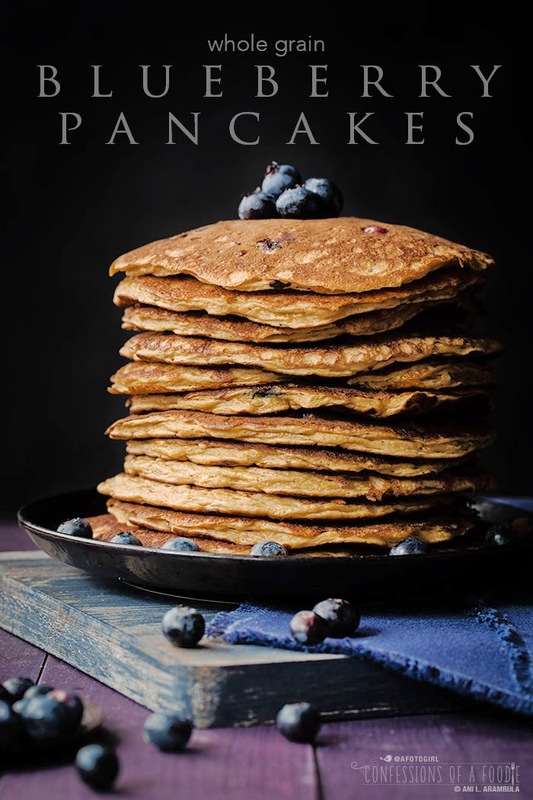 Remove and plate immediately or if you’re making the entire batch before serving, place the pancakes on an oven-safe platter and keep warm in the oven set to 175 degrees Fahrenheit. Allow leftovers to cool completely before wrapping tightly and storing in the refrigerator. These freeze and re-heat well. 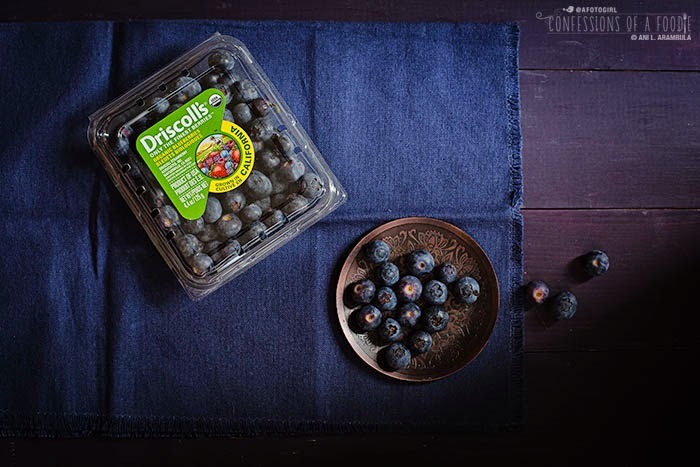 Family owned for over 100 years, Driscoll’s is passionate about growing premium fresh berries. 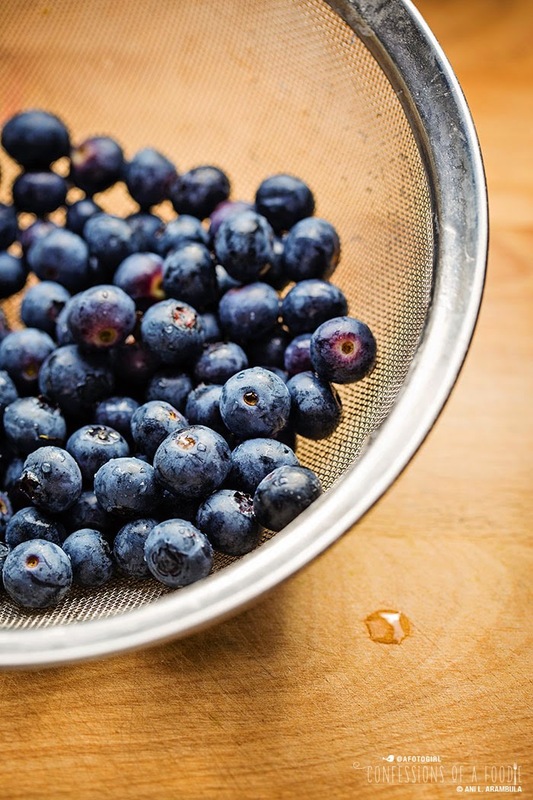 The community of farmers are located in Central and Southern California, Pacific Northwest, New Jersey, North Carolina, Florida, Baja and Central Mexico, Chile, Argentina and British Columbia, Canada ensuring that berries are available year-round. They grow strawberries, raspberries, blackberries, blueberries and organic berries. 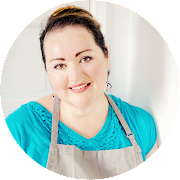 You can find lots of delicious, several quite healthy, berry recipes on their website to inspire your own creations. Search their database here. Disclaimer: Driscoll's provided me with coupons to purchase the berries along with a Whole Foods gift card to help cover the expense of recipe development. I received no other compensation. I agree to do sponsorships and brand partnerships only with brands I trust and have used myself. Recipe and opinions are my own.